WASHINGTON — Higher education gets a big boost this week as thousands of people from across the nation are expected to gather here to celebrate the opening, see and tour the Smithsonian Institution’s new and massive National Museum of African American History and Culture. The opening marks the successful conclusion of a Black history idea that’s been championed in different ways and the cause of generations across color, ethnic and income groups for more than 100 years. With its construction finally approved in 2003 by Congress and signed into law in by then President George Bush, the half-billion dollar, eight floor museum is expected to get its final official blessings this Saturday at an opening program where President Obama is to speak of the symbolic and substantive meaning of the museum to the entire nation. “This is a real big deal for historians,” said Dr. Edna Medford, the noted Civil War historian and professor of history. She was hired by the Smithsonian earlier this year to help train docents at the African American Museum of History and Culture on the Civil War and emancipation. “The museum will show we (Black Americans) have a culture, we have a history,” said Medford, a history professor at Howard University. Medford is among several dozen historians the Smithsonian turned to in developing its African American history and culture facility, just as it has consulted knowledgeable academicians for years to help develop programs and exhibits for its other 19 museums, all owned by the public and admission free to visitors. “You can’t get a true picture of America without understanding and being aware of African American history,” said historian Dr. Reavis Mitchell Jr., chairman of the Tennessee Historical Commission, touting the importance of the new Smithsonian Institution entity. Mitchell said the new museum can be a “hub and spur” for all Americans for focusing greater attention to the role of Black Americans in the state’s and nation’s history. Noting, as do real estate sales people, Mitchell said “location, location, location” is a key element in getting a person’s attention. That being a fact of life, he said he was also “excited” about where the new museum is placed in the nation’s capital, saying the location will help the facility serve as an unavoidable drawing card to visitors to Washington. The massive 390,000 square feet, eight level bronze building is situated on the nation’s Mall, on the corner of Constitution Avenue and 14th Street North West. It is within footsteps of the Washington Monument, Lincoln Memorial and Vietnam Veterans Memorial, between the White House and Capitol Hill. On the floors ― three below ground and five above — are a seemingly endless collection of historical snapshots of Black history in America — the good, bad, ugly. Regardless of the nature of what a tourist sees, this is all real, no make-up, said Medford and others who have been on small preview tours of parts of the museum. The collection ranges from shackles worn by Blacks captured in Africa and the Caribbean islands and brought to `the new world,’ a bill of sale for a young African slave girl sold at auction, notes of the Black men and women who fled their plantations in the 1860’s and joined Union forces to fight for their freedom during the Civil War, a military airplane used in the 1940’s by the Tuskegee airmen during World War II. The collection displays include artifacts, documents from a historically Black Texas college debate team that defeated a Harvard University team, priceless items from the Tennessee State University Tigerbelles track team, a sealed case showing part of the coffin that held teenager Emmett Till after he was lynched in 1955 by a White mob in Mississippi. The museum also features a military uniform worn by Gen. Colin Powell, the cherry red Cadillac driven by rock and roll guitarist Chuck Berry, boxing gloves used by professional boxer boxer Muhammad Ali, sports kiosks including historic sports icons Jesse Owens of The Ohio State University and Althea Gibson, Wilma Rudolph and Chandra Cheeseborough among others. It includes copies of correspondence between authors Alex Haley and James Baldwin and a several phonograph records from the pre-CD era of hit records. “It’s going to advance race relations,” said Dr. Nikki Taylor, Dean of Liberal Arts and Behavioral Science at Texas Southern University, asserting the museum will help the higher education and elementary and secondary education levels expand their abilities to teach the broad role Blacks have played for decades in building America. “You would have to read a lot of history books to get what a person can see” in the new museum in a visit, said Taylor, adding that the museum should serve as an “inspiration” for people of all backgrounds to learn more about the nation’s history. The African American Museum of History and Culture reflects the most ambitious public-private history preservation efforts in the nation’s history. While contributions to the Smithsonian and other history and ventures around the nation have enjoyed generous support over the years, small and ambitious museums focused on Black history have struggled for support. The turning point was the decision by Congress to fund half of the estimated $500 million costs of design, construction and setting exhibits with the rest to be contributed by the public. The fundraising, construction and completion work was assigned to Dr. Lonnie Bunch, a long time Smithsonian curator for the Smithsonian’s Museum of American History. Bunch had been marshaling the museum idea since the early 1990’s, some colleagues recalled recently. 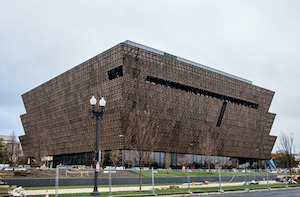 Sine his appointment as the founding executive director of the Museum of African American History and Culture, Bunch has meticulously managed the private fundraising and daily construction and detail work on the massive structure and its displays. The public responded to his appeals from the Smithsonian to help raise the rest resulted in thousands of donors with contributions as small as a few dollars and some running into the millions. Media mogul Oprah Winfrey was an early supporter of the museum. She is now among a handful of major donors to the project, having donated more than $20 million toward underwriting its construction costs, the museum said in a recent listing of donors. “I’m so proud of African American history and its contribution to our nation as a whole,” Winfrey said in a June, 2013 statement that accompanied the announcement of a $12 million contribution. The turnout this weekend is likely to be larger than expected, based on early indications of interest. Earlier this month, when the museum confirmed an official opening for September 25, after months of delay, an online lottery of debut tickets resulted in some 50,000 tickets being snapped up in less than half an hour, museum officials said. That surprising public interest caught some history buffs off guard, as they discovered they could not get tickets, despite having already paid for transportation and hotel rooms to get to the city and stay to participate in the opening activities. That turn of events prompted the museum to issue some 80,000 more free tickets for this week’s opening.